People love to stay connected! Customize capitive portal login page with your own branding. Get more control over your WiFi network by setting Bandwidth or Time Limits Per User. Authenticate every user (SMS OTP, email or voucher). Blaclist unwanted users from accessing your WiFi. Reduce WiFi management costs - add unlimited routers and manage them remotely. Create time based vouchers that be sold as printed copies or via the capitive portal page. MuftWiFi capitive portal automatatically records a log of all user sessions and activies. 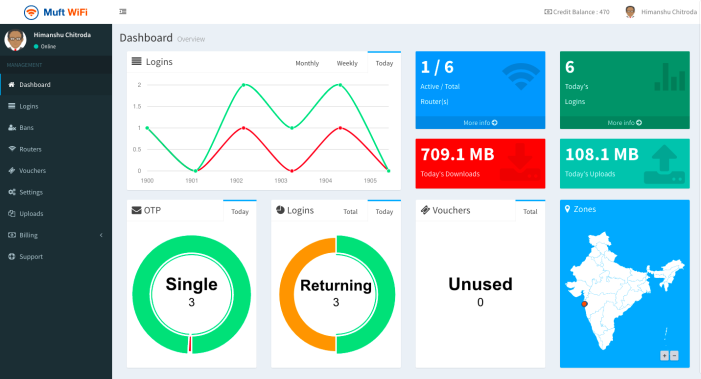 Add unlimited routers, track user activity and manage your entire user database remotely by logging into our online WiFi Management software. Customzie your capitive portal with smart WiDi advertising. Access all their login data with our online MuftWiFi Hotspot Software. Generate voucher codes, print them and sell them at a price you set! Users will login with their Mobile number, OTP and Voucher code. WiFi Authentication: Authenticate users without passwords or via Email, SMS (OTPs). Number of Sessions per month: As many as you like! INR 5 per session for Indian users.